It is vital, in a Liberal democracy, that the Judiciary is independent and neutral. 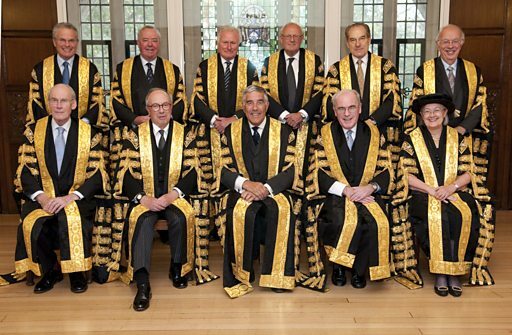 The highest court in the UK is known as the Supreme Court. It consists of 12 Justices, supported by a team of professional and legal staff. The President of the Supreme Court is Lord Phillips. Until August 2009 the most senior Judges, known as Law Lords, sat in the House of Lords. In order to separate the Judiciary more effectively from the Executive and the Legislature a Supreme Court was established and in October 2009 the Judges sat for the first time in their own building. The Home Office was split and a Ministry of Justice was created, headed by a Minister for Justice, who is currently Ken Clarke. The Ministry of Justice is responsible for courts, prisons, probation and criminal law in the UK. The Supreme Court, as well as being the final court of appeal, plays an important role in the development of United Kingdom law. In particular, Judges have been involved in interpreting the Human Rights Act and its implications for UK law. Judiciary – refers to the senior levels of the UK Judiciary including the High Court (108 Judges), the Court of Appeal (37 Judges) and the Supreme Court (12 Judges). These courts hear civil and criminal cases and appeals, applications for judicial review and often settle the law in landmark cases. judicial independence – the idea that the judiciary is free of political interference and that they can make their decisions in accordance with their judicial oath “without fear or favour”. They cannot be easily removed from office, their pay is guaranteed by the consolidated fund, judicial appointments are no longer made under the PMs exercise of patronage (instead they are made by the independent Judicial Appointments Commission) and the Constitutional Reform Act 2005 formally separated the Law Lords from legislature creating a wholly independent Supreme Court. Politicians must not comment on matters which are subject to proceedings before the courts. Judicial neutrality – the idea here is that judges are free from political bias. They apply and interpret the law in a neutral way and have no bias or interest in a particular outcome of any case. Judges should not openly engage in party political matters and should not allow personal or political preferences to influence their decisions. Civil liberties – the Liberal idea that democracies are characterised by certain rights, freedoms and civil liberties; the main civil liberties include political rights (voting; candidacy; joining parties and pressure groups – freedom of association); freedom of movement; rights of protest; social rights (abortion; homosexuality); freedom of conscience; property rights; freedom of expression. The judiciary play an important role in upholding these rights against arbitrary exercises of power. Constitutionalism – rules based governance and behaviour. Also distribution and separation of powers; checks and balances; pluralism and toleration; In Locke’s words “power should act as a check unto power.” Governance should be in accordance with constitutional principles and their should be no arbitrary exercise of power. Checks and Balances – Closely related to Montesquie’s ideas of the formal separation of powers. The tendency of the state to aggregate more power unto itself and to become tyrannical needs to be resisted at all times. Formal checks and balances within the political system and a distinct separation of powers between the legislative, executive and judicial branches is the best way of achieving this. Declaration of incompatibility – Legislation which contravenes the provisions of The Human Rights Act (1998) may be declared incompatible with this Act and sent back to parliament for reconsideration and amendment. The small number of declarations of incompatibility made by the Judiciary is indicative that Parliament legislates carefully and takes the HRA into close consideration when drafting legislation. Judicial Inquiries – these are launched by the government when some aspect of public policy or other conduct has gone so seriously wrong that it merits a full judicial investigations into all the facts and the evidence surrounding the policy or the event. They are open inquiries and their findings are published by the Judge heading the Inquiry. Most notable inquiries have been the Hutton Inquiry, The Scott Inquiry, The Leveson Inquiry, the Saville Inquiry and the Chilcott Inquiry. Parliamentary sovereignty – In the UK system, parliament is the cornerstone of sovereignty. Acts of Parliament therefore cannot be challenged in the courts except where they contravene Community Law (In which case the ECJ can strike them down) or where they are found to be incompatible with the Human Rights Act. The judiciary have very limited powers to review Acts of Parliament. One of the principles of Parliamentary sovereignty is that parliament has the capacity to make any law whatsoever including the power to unmake law. This is why it is possible for the new Conservative government to scrap the Human Rights Act if it chooses to do so. Social representation / Lack of – this refers to the idea that the senior judiciary are part of the same white, male, upper middle class, privately educated conservative elite that dominates parliament, the civil service, business and the senior military. Griffith – The Politics of the Judiciary, argues that their social composition and their conservative values make them “strikingly homogenous” with these other dominant groups in society and that this explains their conservative disposition and hostility to minority rights, trade unions and civil service service whistleblowers. Why and to what extent have judges come into conflict with government in recent years? There has, in recent years, been a number of conflicts between judiciary and government. This has been due to three factors; the increasing liberalism of the judges (and perhaps of the public also), causing them to place emphasis on civil liberties and human rights and challenge government when it has been seen to threaten them (culture change), the creation of the Human Rights Act may have strengthened the tools available to the judiciary to challenge government, and a possible trend toward greater authoritarianism by government (although government would tend to argue that it has faced peculiar challenges, notable that of terrorism, which has in turn necessitated the creation of legislation that has caused problems with the judiciary). Under the old ‘Westminster model’ of government, the judiciary knew its place. It was subordinate to the power of Parliament and particularly, the executive. In recent years a number of developments have led to growing judicial confidence and activism. This has sometimes brought them into conflict with government. This conflict is often based on different constitutional preferences. A number of ministers have felt that parliamentary sovereignty is coming under threat. This sovereignty is based, in their eyes, on the responsibility they have to balance rights and responsibilities, and the direct line of legitimacy they possess in relation to the public. Judges in turn have become more robust. They suggest, much more forcefully now, that liberal democracy is (at least the liberal part) about limited government and checks and balances. Their role therefore is to protect civil liberties and to challenge governments when they threaten them, even if this goes against the will of the majority. Traditionally the rule of law, one of the centrepieces of the UK constitution, was intended to act as a check on government. But in the UK constitution parliamentary sovereignty has, in practice, been a higher principle. That is, it is left up to parliament to create law – it can make, unmake and amend any law. It seemed to be an article of faith that parliament would never create laws that threatened civil liberties. Vernon Bogdanor suggests that it never occurred to commentators on the constitution such as Dicey that governments in the UK might do such a thing. This faith in parliament and in the ‘decency’ of government is seen as being rather quaint now. Before, during and after the 2nd World War though there was a sense that the British system prevented the abuses to civil liberties that took place in Germany and elsewhere. Much of this faith could be put down to a superiority complex – the sense that the British system was the envy of the world, and that others sought to copy it. Gradually though throughout the post war period this faith dissipated. There was a gradual culture shift among the judiciary. They became rather more liberal in outlook, likely to see rights as being absolute and unconditional, and to view themselves as being an important check on the dominance of the executive. There was a culture shift in the country also. People became much more willing to challenge public authority. This latter change has led to an increased number of cases being brought to judicial review (there were fewer than 600 in 1981, compared to more than 6,000 in 2007). Judicial review takes place when public authorities are deemed to have acted beyond the powers given them by a piece of legislation (they have acted ultra vires in the Latin jargon). Recent cases involve the education secretary, Michael Gove, who was found by a judge to have acted unlawfully in failing to consult local authorities over the decision to scrap the ‘Building Schools for the Future’ programme. Another case involved the unlawful closure of local libraries (in Gloucestershire). Gloucestershire County Council was found by a judge to have breached equality rules (the effect of closing libraries would, in his judgement, have had a disproportionate effect on vulnerable groups in the area). The proliferation of these cases has potential to cause conflict with government. Perhaps though, one of the main reasons for conflict has been due to legislation brought in by the government itself. The Human Rights Act (HRA, 1998) was created to bring UK law in line with the European Convention on Human Rights. It was a major constitutional reform in that it marked a shift to a codified set of individual rights (the rights were already there, but they had to be exercised in the Strasbourg court, which was costly and time consuming). In doing so it was a step toward giving the judiciary greater powers to protect civil liberties and check executive power. A number of cases have been brought which demonstrate the potential for the HRA to generate conflict between judiciary and government. Examples include: the decision not to deport the murderer of headteacher Philip Lawrence – the ‘right to family life’ and the existence of a family in the UK meant that he was allowed to stay in the UK even though he is an Italian national; an Iraqi who ran over a girl, killing her, then fled the scene, was allowed after completing his sentence to remain in the UK also because he had a family here. Perhaps the most serious cases though have involved disputes over suspected terrorists – the Abu Qatada case for example, currently making its way through the courts, is relevant because of the claim of ‘freedom from torture’ and ‘right to fair trial’ embedded in the act has proved a stumbling block in deporting him to Jordan. The Home Secretary is desperate to deport him. She and other government ministers have openly criticised the HRA, the ECHR and the Court of Human Rights in Strasbourg for delaying this process, and, making decisions which as they see it intrude on the sovereignty of parliament. The previous Labour government was openly critical of decisions made by the courts on a number of issues as well, but particularly related to anti-terror legislation. Some of this legislation has been seen to breach the human rights of terror suspects – detention without trial, pre-charge detention (42 days, 28 days etc), rights to deportation of those considered to be promoting terror, control orders. They argued that governments have a duty to balance the rights of terror suspects with those of members of the general public (right to life – not to be blown up), whereas judges only have a very narrow remit, to consider the rights of the individual suspect. While these are substantial areas of conflict, it could be argued that the judiciary are still subordinate to parliament and to the executive. The HRA does not give the judiciary the same degree of power as possessed by judges in the USA or Germany for instance. In these countries civil liberties and human rights are protected by constitutional documents which have a higher status than ordinary law, significantly constraining executives. If the judiciary wants to challenge a piece of legislation using the HRA in the UK it can only issue a ‘declaration of incompatibility’, which sends the legislation back to Parliament for revision. It cannot just dismiss the legislation as being in breach of the constitution. So why do ministers become so upset? Well it may partly be because of their duty to protect the public, as discussed (they are the ones in the firing line if something goes wrong, not the judges). But there may be other reasons also. The reason why ministers become so exercised is because we have not previously had a very liberal constitution. The Westminster model of parliamentary sovereignty and a strong executive has been ingrained in their habits and expectations (as it has in the expectations of the public – this is perhaps why they don’t like it when institutions other than the government make unpopular decisions and contradict the will of democratically elected ministers). Maybe the rise of the judicial activism is just a sign of how a liberal democracy with some degree of separation of powers does actually work though. So the conflict has been based on the degree to which power should be shared, and ultimately revolves around differences of opinion about what kind of constitution we should have. A fan of a constitutional democracy would argue that ministers should just get used to judicial activism. In which case they perhaps would not be happy with judicial decisions but recognise that this is all part of a liberal democratic system. The problem is that ministers are also under pressure from various media, who claim to speak for majority opinion (ie about terrorist suspects). In liberal thought the defence of civil liberties and human rights is fought not just against a potentially tyrannical government ie autocratic dictator, but also against the ‘tyranny of the majority’ – majorities in societies can also be fairly intolerant of unpopular groups and individuals (terrorist suspects, paedophiles, rapists, homosexuals, minority ethnic groups etc etc). A liberal judiciary would argue that it is their job to stand up for these people (this is why the judiciary could never, in a liberal system, be elected by the populace – they would then become subject to pressure from these majorities). Governments, in contrast, feel the democratic pressure to express the will of the people. Hence the constant tension, particularly in periods of emergency (ie following terrorist events), when vulnerable minorities are often targeted. In February 2000 nine Afghan nationals hijacked a passenger plane and flew it to Stansted Airport where they were arrested after an armed siege. Successive Home Secretaries tried to deport them but the High Court ruled in 2006 that the refusal to allow them to stay breached their human rights. Abu Qatada, the man once nicknamed Osama bin Laden’s “righthand man in Europe” was allowed to remain in Britain after a tribunal ruled that to deport him to face trial in his native Jordan would breach his human rights. How effectively can the judiciary control executive and legislative power in the UK? judges cannot be pro-active – they must wait for appeals to be brought before them. Despite recent examples of judges becoming involved in public debate, they are expected to maintain a low public profile and maintain political neutrality. a) With reference to the source, describe the measures that exist to maintain the independence and neutrality of the judiciary. The salaries are fixed and cannot be reduced by government or parliament. This means that finance cannot be used to place pressure on the judiciary. Parliament does not allow itself to comment on sub judice cases. Similarly ministers and civil servants cannot interfere with cases in progress. Neutrality is safeguarded by the bar on political activity by judges. b) With reference to the source, and your own knowledge, explain how the judiciary has been reformed since 2005. Two reforms are referred to in the source. One is the changed position of the Lord Chancellor, removing him from his position as head of the judiciary. The other is the creation of an independent Supreme Court. The other main reform is the establishment of the independent judicial appointments commission which vets proposals for appointments to senior judicial posts and ensures the political independence of nominees. The removal of the Lord Chancellor from the House of Lords speakership and from the leadership of the judiciary takes away this historical erosion from the separation of powers. It goes some way to ensuring more independent appointments. The establishment of a separate Supreme Court is designed to separate the court from the legislature and so create more independence. The Appointments Commission removes much of the political influence of the Prime Minister and Lord Chancellor who have had the final say over senior appointments. The reforms became more necessary after the passage of the Human Rights Act and the extension of judicial review which has followed. They are now appointed by an Appointments Commission who seek to ensure both independence and neutrality. This is reducing political patronage. The new Supreme Court underpins a new separation of powers, removing judges from the legislature. Judges still cannot be dismissed except for misconduct. Their salaries are guaranteed and cannot be reduced to put pressure on them. Parliament and ministers are, by convention, forbidden from commenting on cases before the courts. Judges are forbidden from engaging in active politics or from making political comments in public, which tends to create neutrality. Attempts are now being made to recruit and promote more women and ethnic minorities to prevent any cultural bias. Judges are all experienced courtroom lawyers who are used to serving the law and the rule of law in a neutral fashion, rather than in an arbitrary way. This underpins both independence and neutrality. Judges have developed a greater freedom in making political comments, notably on sentencing issues and rights, demonstrating that they seem to be more independent of the state than in the past. On the other hand there are still barriers to full independence and neutrality. There are still very few women or members of ethnic minorities in the senior judiciary. There is still a bias towards those educated privately and at Oxbridge, suggesting a more ‘establishment’ approach. It is argued that the Supreme Court is only a ‘cosmetic’ exercise. How effectively can the judiciary protect civil liberties in Britain ? By enforcing the rule of law, ensuring all are treated equally. By hearing cases of discrimination which might adversely affect the rights of women or minorities. By upholding the European Convention of Human Rights or common law rights or statutory rights through the process of judicial review. Cases may also ultimately be taken to the ECHR. By other judicial review cases dealing with the ways in which government has acted and reached decisions, ensuring that government does not abuse its powers at the expense of civil liberties. Judges can, by acting in the legislature or other media, express views on civil liberties that might influence government and parliament. Generally, by preserving their independence, judges can maintain their ability to protect liberties. Judges cannot be proactive and must wait until appeals are lodged. The lack of an entrenched constitution makes the understanding of rights civil liberties difficult and open to interpretation. Cases such as Belmarsh and the Afghan hijack case demonstrated the power of the judiciary. On the other hand there have been, arguably, erosions of civil liberties – DNA database, ID cards (potentially), changes in mode of trial. Many arguments that governments have become less mindful of civil liberties. Is the judiciary too powerful, or is it not powerful enough? The Human Rights Act has bestowed great powers on the judiciary. The use and effectiveness of judicial review has grown. There have been a growing number of examples of the judiciary thwarting government, for example, Belmarsh, cases on asylum seekers, issues of sentencing etc. The growing independence of the judiciary has been significant. Parliamentary sovereignty means the government can overrule the judiciary. The judiciary cannot make judgments beyond the jurisdiction of the law even in the interests of natural justice. a) ￼With reference to the source, why was the government criticised over the decision to freeze the assets of the suspected terrorists? The executive orders which were used had not been voted on in Parliament. The Treasury has exceeded its powers. Labour was behaving as if it were a police state by arbitrarily confiscating people’s property without due process. The Government was desperate to avoid consulting parliament etc. b) With reference to the source and your own knowledge, explain judicial review and its importance. This is a case of judicial review. The court examined whether the action concerned was lawful, whether it had the sanction of parliament. This is an example of ultra vires. Judicial review examines whether a public body has operated beyond its powers. Judicial review of this kind prevents the government operating in an arbitrary way. It can also protect the rule of law which demands that government must operate within the laws. Judicial reviews can also be held in relation to the Human Rights Act (ECHR), to decide whether that has been offended. Judicial reviews can also be the result of alleged unequal treatment, unfair treatment, or where the legal procedures have not bee followed. They may occur where natural justice has not been followed. All public bodies or organisations involved in public business may be the subject of judicial review. c) To what extent is there conflict between the judiciary and the executive in the UK? The kinds of conflict which have arisen are : Disputes over who should control sentencing, possibly noting the work of the new Sentencing Council. Disputes relating to the Human Rights Act, with government sometimes pushing the boundaries and judges seeking to safeguard rights. Particular problems relating to the government’s anti terrorism policies and their impact on human rights. Similarly the threat to rights posed by law and order policies in general, such as ASBOs, surveillance, DNA records etc. This should be balanced against the reality that the judiciary cannot challenge actions which have been sanctioned by parliament. The fact that judges are unelected and unaccountable places them in an inferior position to parliament, and therefore government when it acts within the law. That said, though the ECHR is theoretically subordinate to parliamentary sovereignty, in practice when the courts assert the ECHR, it tends to force government to change policy or pass new laws. Signs that the new Supreme Court is becoming more assertive but ministers continue to resist the influence of judges. a) With reference to the source, what is the rule of law ?All behaviour in society should conform to law. This also therefore applies to government.Everybody should be treated equally under the law.Punishment must be reserved for those who have been convicted of crimes. In other words there must be no arbitrary punishments. b) With reference to the source and your own knowledge, explain how the independence of the judiciary is guaranteed. The nature of judicial independence should be explained, either explicitly or implicitly. This will refer to independence from influence from government, parliament, political associations, media etc. The independent role of the Lord Chancellor is now guaranteed. The improved separation of powers with the establishment of the Supreme Court. The judicial appointments system is now virtually independent of political interference. the rules of contempt which prevent parliament or ministers from influencing cases in progress. c) To what extent can judges check the power of the executive and the legislature ? The courts are guardians of the rule of law. Judicial review can prevent the exercise of arbitrary power, ultra vires issues and the unequal or unfair treatment of citizens. The Human Rights Act enables the judiciary to strike down executive acts which offend human rights. the ECHR and so weaken the authority of parliament. The judiciary cannot set aside primary legislation passed by Westminster so ministers can circumvent the ECHR. The judiciary cannot be proactive but must wait until cases are brought before it. They also have no pre-legislative function. Judges may strike down executive action, but cannot prevent government from asking parliament to legislate to overcome judicial objections. To what extent do judges protect individual rights and freedoms in the UK? The main ways in which the judiciary can protect rights and freedoms, together with their limitations, are :By guaranteeing the rule of law, i.e. ensuring equal treatment under the law, ensuring fair trials and enforcing law against government itself. However, this is vulnerable to parliamentary erosion (e.g reduction of jury trials, double jeopardy etc.). By declaring and enforcing common law rights and freedoms. However common law can be set aside by new statute law. By enforcing the European Convention on Human rights. The limitation is that it cannot be enforced against primary Westminster legislation. By enforcing European legislation on economic and social rights. This is largely unlimited, though it may be noted that UK courts must abide by precedents from the European Court of Justice. By conducting judicial reviews where citizens or groups may feel they have been the victims of arbitrary power, unequal treatment, injustice etc. This is increasingly effective, though government may grant itself powers with the sanction of parliament. Some judges have adopted a high profile role in ‘championing’ rights and freedoms in public forums (e.g. Lords Woolf, Bingham and similar). Such judges have authority and influence. However, their political role remains legally circumscribed. Arguably the judiciary has become more independent since 2005 so judges may feel freer to challenge executive power. Candidates should, where possible, use examples and illustrations to support arguments, analysis and evaluation. In what ways, and to what extent, is the Human Rights Act controversial? Knowledge and understanding of the controversies surrounding the HRA. These might include :The fact that it is enforced by an external court – the ECHR.The conflict between the need for security of the state and individual liberty. The conflict between privacy and freedom of the press. Issues concerning immigration and asylum. The idea that judges are effectively ‘making law’ despite being unelected and unaccountable. Controversy between and within the political parties. That there is a strong rights culture and many in the centre-left-liberal spectrum of politics support the operation of the Act. Many see it is a vital counterbalance to the power of the state. Most rights in the ECHR are already part of UK statute or common law. Examples and illustrations, probably about real cases of significance are desirable. To What extent is there conflict in the UK between judges and government ministers? To what extent are judges better guardians of rights and civil liberties than Parliament or the executive? Is there a chance I can get the complete spider diagram in a single file?